New year, new you, right? ‘Tis the season for #balikalindog, and typically most people will take up some sport or other to burn the fat and slow down the relentless onslaught of aging. When I was just starting out in triathlon around 15 years ago, I admit to being quite the slob when it came to transporting my gear around. I had a big gym bag for all my stuff, a couple of used grocery bags for the greasy/muddy/sweaty stuff, and I basically just stuffed my bike in the back seat and was good to go. Time and an irate spouse have made me a little bit wiser. If you just stuff your bicycle in the backseat, you are bound to get the upholstery dirty at best and tear up the leather at worst. If you have no system for storing your sweaty clothes, you are bound to lose them somewhere in the journey from car to locker room to house to laundry room. And at up to $300 (around P15,000) a pop for a premium cycling kit, mistakes can get very expensive. In my line of work, I have a club ride at least once a week, typically on Saturdays. We roll out by 6:15 am, and nobody ever wants to be that guy or girl who shows up at the parking lot with five minutes to go, scrambling to get everything in order and wouldn’t you know it… he left his helmet at home! I have heard of stories where someone actually forgot his bike, too. 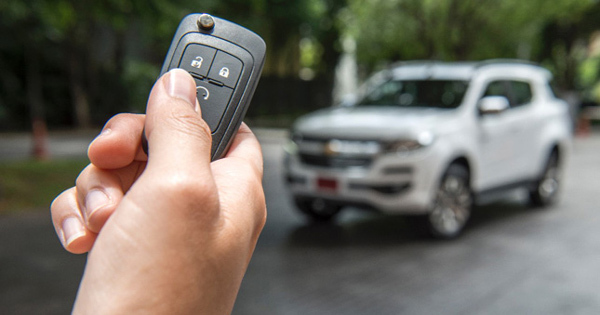 To save yourself a lot of unnecessary stress, here are a few tips to get your vehicle sorted out for your journey into fitness. 1) Get a box for all your cycling stuff. Shoes, helmet, hand pump, floor pump, chain lube, wet wipes, multi-tool. 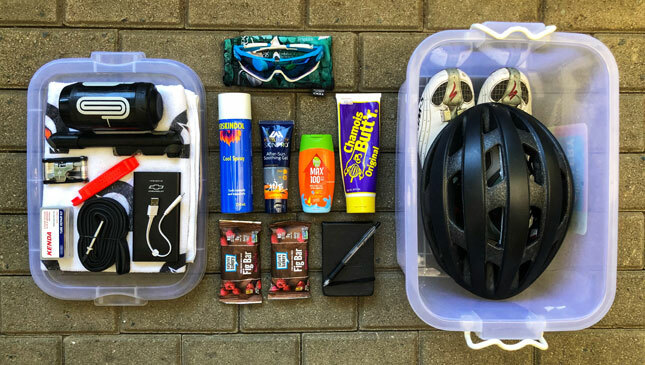 These items should only ever find themselves either on your person when you ride, or in the box. The exception is the helmet, which you should always clean after every ride while you shower. Never place these other items anywhere else in the house. You’ll lose ‘em sooner or later, or you’ll be scrounging around in the trunk trying to find them. 2) Invest in a bike rack. 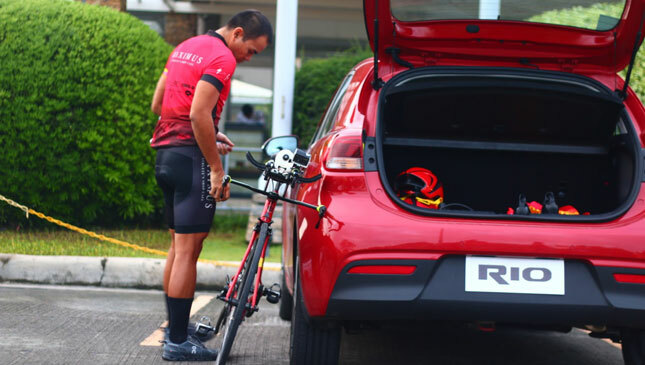 If you’ll be regularly schlepping your bike, a quality bike rack will simplify your life and free up cabin space. You have a choice between roof- or rear-mounted. Either system has its pros and cons. A roof rack like a Thule or Yakima looks neat but can present a big problem for areas with a low overhang. If you’re on the petite side, you may need to get small step-up to be able to lift your bike onto the roof. A rear-mounted system like a Kuat paired with a HitchPro is easier to use, but you should take greater care when turning as this lengthens your vehicle’s 'tail.' If you have multiple cars, perhaps a SeaSucker mount is the best option as you can easily transfer this between vehicles. 3) Get another box or bag for your extra clothes and towels. This is always in the car and replenished as needed. You never know when the skies will pour while you’re out riding, necessitating a quick change of clothes before the drive home. 4) Always have a laundry bag. Don’t just stuff your wet clothes into your gym bag. You might forget they’re in there when you come home and collapse from another exhausting, epic ride. Do not turn your gym bag into a petri dish of bacteria. 5) Deodorize your trunk. Go to True Value and buy a bunch of deodorizers to keep your trunk from smelling like a locker room. 6) Cooler is optional. You probably don’t need this if it’s just for a weekend ride, but for training camps it pays to be self-sufficient. A 45- to 50-liter cooler is big enough to store several bottles of water and sports drink, but not so huge that it eats up all the valuable trunk space. Get one with wheels so it’s easier to move around. 7) Clean as you go. You are bound to have empty bottles and plastic food wrappers at the end of a ride. Gather all your trash and dispose of these properly. Don’t be that slob with a year’s worth of accumulated trash in his trunk. Eww. Can a dealer take back a discount even if I've signed the papers?